Alice in Wonderland remix. What do you think about it? I would like you my dear friends myloters to listen to this remix: http://www.joemonster.org/filmy/9025/Remix-Alicji-w-krainie-czarow It have been done only with the original sounds from the cartoon. Impressive? Do you like this kind of music? That was pretty sweet. I honestly wasn't expecting that. Did you come up with that? It's really interesting. And I like how the beats are timed with the dance sscenes so perfectly. I think this could actually become popular if it gets more attention. In all honesty I don't like it. I think that somebody has done well remixing it because it plays well, I wouldn't know where to start with something like that, so I think it's good that they can use this talent. However I personally don't like repetitive music and I dislike remixes as well, so my reason for not liking it proably stems from my dislike of that kind of music. 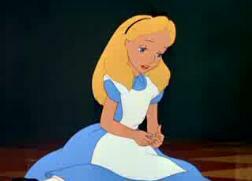 I really like Alice in Wonderland though and I guess its interesting to view it in a different way.